Puck Pentenga shields the ball from a defender. The junior midfielder will lead the No. 8 Wildcats into a showdown with No. 4 Michigan on Friday. A potential Big Ten title is on the line this weekend in Ann Arbor, Michigan, as No. 8 Northwestern takes its talents eastward to play No. 4 Michigan. The Wildcats (12-4, 5-1 Big Ten) are second place in the conference standings, but control their own destiny in the season’s final stretch. With weekend wins over first-place Wolverines (13-2, 7-0) and Michigan State, (8-8, 2-4,) they’ll guarantee a share of the Big Ten crown. The marquee matchup is Friday against Michigan, which has lost only twice this year. One of those losses came against No. 1 Connecticut, but the second was a 1-0 upset on Sept. 8 at the hands of now-No. 18 William and Mary. The Wolverines may be vulnerable, but they boast a prolific offense led by sophomore forward Meg Dowthwaite, who ranks seventh in the nation and leads the conference in goals per game. She’s the catalyst for Michigan’s high-powered attack, which ranks sixth in the country in goals per game, at 3.5. 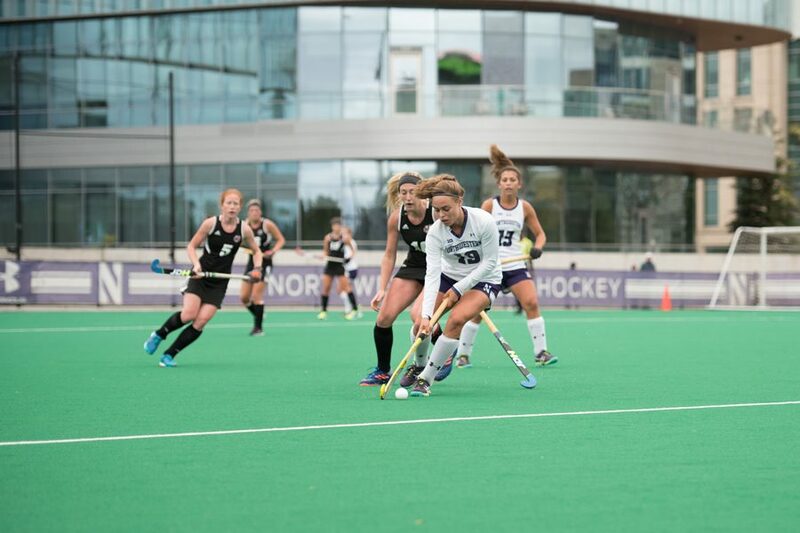 NU, however, has reigning Big Ten Offensive Player of the Week Puck Pentenga spearheading its attack. The junior midfielder leads the conference and ranks seventh in the nation in assists per game. She leads the team in shots and shots on goal as well and has played a central role in the majority of the Cats’ conference-best 150 penalty corner attempts this season. Those chances will be crucial for NU against Michigan this weekend. During the Cats’ six-game winning streak, 14 of 23 goals have come from corner opportunities. Michigan, however, also boasts a formidable defense. The Wolverines rank third in the country in goals against average, allowing only 0.83 per game. Senior goaltender Sam Swenson is second in the Big Ten in save percentage and has recorded six shutouts in 15 games this season. If NU takes down Michigan, the Cats will also need to defeat the Spartans at home Sunday to secure their share of the conference title. With NU close to its first Big Ten regular season championship since 2013, Fuchs is excited that her team controls its own fate.